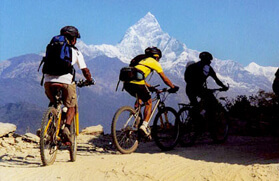 Riding a mountain bike in the Garhwal Himalayas can become an adventure if you have the eye for adoring picturesque surroundings! No- it's not like the Tour de France, but it can still bring out that explorer from you. 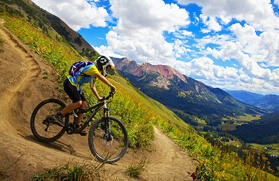 Peak Adventure Tours showcases some of the best cycling experiences, that a cyclist looks for. 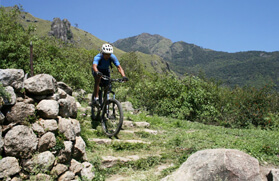 Mountain biking of course requires fitness as the Indian terrain is both rugged and rough- especially the North Indian ones. Stamina and perseverance will also help you climb steep patches, and mastering the control fact also becomes a good confidence booster for a biker, especially on Garhwal Himalaya mountain bike trails where numerous surprises can always catch one unawares. In the morning meet the executives of Peak Adventure Tour executive at New Delhi Train Station and then catch the AC Train for Dehradun scheduled at 06:50 AM. By 12:00 Noon you will reach Dehradun. Upon arrival meet the tour guide and then transfer towards Mussoorie passing through a spectacular valley township of Dehradun. We will be having scrumptious lunch on the way. Mussoorie is exquisite hill station and is famous as a honeymoon destination for the newlywed couples. After reaching, check into the hotel. Later, in the evening time, you can go for a short bike ride close to the hotel and become accustomed, with the bike. We will enjoy the overnight stay at the hotel in Mussoorie. On this day, after having wholesome breakfast in the morning brace yourself for your very first biking excursion in the direction of Dhanolti. It will be a very easy and undemanding uphill ride over the mountain crest. On the way, the ride covers exceedingly pictorial backdrops and overlooks the deep valleys and soaring mountains. You can have the real exquisite and fabulous views of the Garhwal hills in the unblemished Cedar encircled Dhanolti. After reaching, the destination check-in to the hotel. We will be staying overnight at Dhanolti in a hotel. 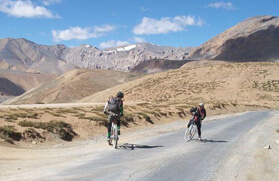 Today, after having healthy breakfast in the morning be prepared for the thrill and excitement of downwards mountain biking at first to the Yamuna overpass and then, a ride over a roughly flat road, till the New Tehri (located near to the River Bhagirathi). It is a very striking hill town which was made after the Tehri Dam constructed, the old Tehri residents relocated to this region. We will stay overnight at a guest house/hotel overlooking the biggest artificial man-made lake located in Uttarakhand. 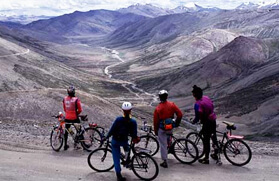 On this after wholesome the breakfast, ride your bike downwards towards our destination Ghansali positioned in the (River Bhilangana valley) passing through Mulgarh. A modest hiking today and a large downwards run marks the finish of the today's session of biking excursion. We will stay overnight at a Guesthouse at Ghansali. After having healthy breakfast be prepared for the today's biking excursion in the direction of Chirbatia an unwavering ascend usually. Today, on the way, we will ride our bikes all the way through verdant Oak forests. The entire region is inclusive with exceptional and various medicinal herbs and repertory of blooming wild flowers. We will stay overnight at a Guesthouse at Chirbatia. Today, in the morning after the days the route ride briefing, take the bikes and move ahead in the direction of Chandrapuri, a little marketplace of the villagers living in the nearby area. Take a ride through some the local markets negotiate the local traffic. We will stay overnight at a Guesthouse at Chandrapuri. On this day, after having the breakfast, we will begin our day and ride head for Ukhimath. The bike ride will be easy till we reach Kund (From this point one road goes on the way to Kedarnath and the other goes to Ukhimath). From here we will ride for about 23 kilometers through a desolate road and a spectacular uphill bike ride towards Ukhimath. After reaching the destination, check into the hotel. Later in the evening you can visit the famous Ukhimath temple and explore the area around. We will be staying overnight in rest house at Ukhimath. In the early morning witness, the impressive view of the snow covered and towering mountain peaks. 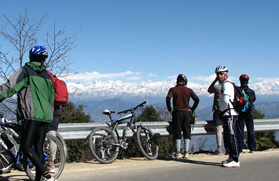 Later after the wholesome breakfast move ahead and ride your bike in the direction of Chopta also known as the 'mini Switzerland of Garhwal'. Today the bike ride is constantly uphill, and although it is not so complicated and too hard, but the continuous paddling will reward you with fabulous views that you can enjoy and explore when the day's ride finishes. Upon arrival, check-in to the tent/guest house. We will be staying overnight at Chopta. In the early morning enjoy the charming and picturesque exquisiteness of Chopta. From here you get to see the breathtaking view of the soaring Himalayan peaks. After having the breakfast we will ride downwards in the direction of Chamoli. On the way, we will be passing through dense forests of the Mandal valley and the captivating hill-town of Gopeshwar. By the evening, we will reach Chamoli. We will be staying overnight at a hotel in Chamoli. In the early morning after having the breakfast, we will drive in the direction of Haridwar by car by way of Devprayag sacred place for the Hindus as it is the convergence of the River Bhagirathi and Rivers Alaknanda, which was visited by Shankaracharya the Great Hindu philosopher & reformer (approximately 800 C E) this confluence of the rivers is known as the place from where the holy Ganga River actually begins. By evening, we will reach Haridwar and then transfer to the Haridwar Railway junction to board the AC train for Delhi Scheduled at 18:15 PM. By 22.45 PM you will reach Delhi.